During the cold winter months, you want to be more confident than ever that you can heat your home safely and efficiently. The SV4-5TK90SS Horizontal Termination Kit from SecureVent offers the confidence you need. It has been designed to fit a SecureVent 4-1/2 inch by 7-1/2 inch direct vent system with up to a 20,000 BTU rating. When used with this system, this kit will increase your heater's efficiency in heating your home. It comes standard with a 90-degree SV-4 model elbow. The galvanized steel and aluminum construction also ensures great durability. If you ever encounter a problem with the kit, it is covered by a limited lifetime warranty. Install a small square SecureVent Horizontal Termination SV4-5HTSS to your vented gas log fireplace system and relax knowing that you have chosen a quality, durable product. This kit has been designed with durable steel and aluminum. The baffled termination moves exhaust away from the building and a secondary baffle keeps the wind from creating a back draft. Designed to be smaller than the standard termination, this product measures 13 inches wide by 14 inches tall and includes a 7-1/4 inch to 10-1/2 inch long adjustable pipe stub. The system also comes with a limited lifetime warranty to ensure customer satisfaction. Choose either a propane or natural gas model when you purchase this lovely fireplace-it's our Superior DRT2000 Merit Series Top Vent Fireplace. You'll like the look of the with aged oak logs crafted from ceramic fiber as well as the overall appearance of this radiant smooth-faced model that boasts attractive, lively flames. Choose electronic or millivolt controls as well as buff stacked or black interior. 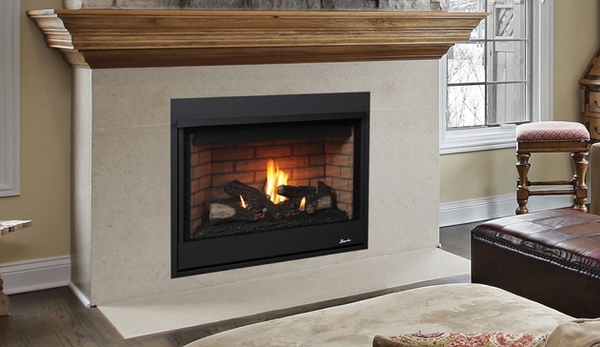 This model meets or exceed fireplace safety requirements. Note that this is a direct vent model that produces 14,000 BTUs and is crafted in a traditional style. This model is available in 35", 40", and 45" models. Is the FBK 250 blower kit compatible with the Superior DRT 2035 fireplace? Yes, that blower is indeed compatible with this DRT2035 fireplace. Can you burn wood in this fireplace? No, it is a gas-only fireplace. Can I use the millivolt gas valve with natural gas? This fireplace can indeed be used with natural gas. What is the actual glass viewing area of the DRT2035 Merit 35" model? The actual viewing area is 32 3/8 inches wide and 22 1/4 inches tall. What are the framing dimensions of this Superior DRT2035 Merit top vent fireplace? The framing dimensions are 35 1/4" wide, 18" deep, and 35 1/4" high. Can this unit be safely operated with glass removed and screen installed? The glass panel cannot be removed during operation; this is required for any direct vent gas appliance. The screen, meanwhile, is removable, but the manufacturer recommends having it in place during operation for safety reasons as the tempered glass on this unit can get very hot when in use.